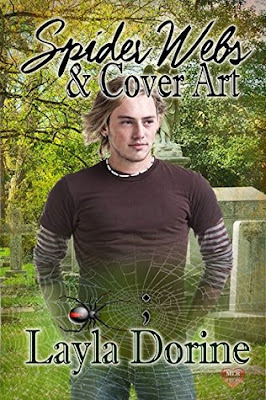 On June 1st, my novella Spider Webs and Cover Art was released by MLR Press. I wrote it in response to their Take A Pause anthology call, which was designed to draw attention to semi-colon tattoos and their meaning. As soon as I read the call for submission I knew I had to write something, the subject was just too close, too personal. In high school I fell in love with music. I also fell in love with a green-eyed brunet who loved ripped jeans and tattered red Converse shoes. Every Saturday morning I went to my guitar lesson and when I was done I went to his house and shared with him what I learned, that way he could learn too. We had dreams you see, of forming a band, buying an old van and driving coast to coast, playing our music and seeing the country. We had dreams of campfires and songs filling the night, starry skies and making memories. In school we were given tan paper for working out math problems. These usually ended up being used for drawings, love notes, poetry and lyrics. He would slip them into my locker between classes, and I would slip them into his pockets when I hugged him in the hall. 25 years later I still have many of them in a keepsake box. They were beautiful then, they are even more beautiful to me now. But for all the beauty he created, there were moments of ugliness too, long jagged lines he carved into his flesh, names he called himself, times he beat his hands bloody on brick walls, or metal lockers. There were scary conversations on the telephones, tears, and a constant fear of losing him to his own actions. There were bloody blades wrapped in paper and left in my locker, or slipped through the mail slot of my apartment. There was poetry filled with darkness and lyrics that spoke of demons and death. Then one night I got the phone call that changed everything, because it was the night that he got sent away. I will always believe that as much as he hated that facility, it saved his life, and though the relationship between us changed in the years that he remained there, I would rather know that he is still playing his music and still filling the world with art and lyrics, than have had him stay and lost him a different way. Instead, we both lost someone else that was an important part of those days and those memories. We lost the smiling, laughing buddy who sat on the porch with me and listened to my fears. We lost the trusted friend that walked through the park with us, listening to lyrics and our hopes for the band. We lost the strong young man who was brave enough to get between my lover and the wall and stop him from hurting himself. We lost the beautiful soul who helped me pick my prom dress then escorted me when my fiancé was locked away and unable to go. We lost him to a gun held in his own hand. To reasons we'd never know. To a pain we missed. To the darkness that insisted on claiming a life that year. It was for both of them and for me that I wrote Spider Webs and Cover Art. Because there is no forgetting those moments or those friendships or that loss. Because time might dull the pain but it never truly heals. Because each year I still cry for a life cut short and a dream that died, the soldier who never was, the friend who always will be forever seventeen and holding me in the one and only picture I have of us together. In a month I’ll get my own semi-colon tattoo and I will wear it on my wrist with pride, front and back, the way I have written Jace wearing it in my story, and like Jace, I hope there will be those who will ask me about it. There are days when it’s still as raw as when I found out. There are times when I still close my eyes and see his grave. In my teens I wore dragons for protection, one of the pieces is buried there, I’d hoped it would guard him on the other side. There are moments when I want to know why, when I picture them both in my head and cry for different reasons. I know I will never understand it, that the peace I have made with it all, such that it is, will have to be enough, at least until I cross over too, and might have the chance to ask him. I'd like to believe that the ones we loved will be waiting wherever it is that dead souls go.